Le Serpent Rouge appears tonight, Wednesday, May 2, at the Velvet Jones for a bizarrely enchanting performance. This darkly mysterious show is a unique blend of bellydance, ragtime, vaudevillian, Middle Eastern, and Gypsy elements all fused into a one-night performance. Needless to say, it’s not your typical rock concert, but an entirely new theatrical experience that recreates the seductive entertainment of the past. Among the three featured acts are the Indigo Belly Dance, a trio of hip-swinging dancers with Gypsy appeal. 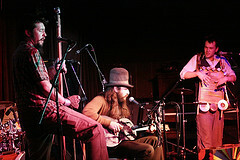 Then there’s The Inkwell Rhythm Makers, a proudly grungy, slightly red-necky jug band. Completing the ensemble is Tobias Robertson, playing the ancient sounds of the old world on his folk instruments. With a surreal mixture of graceful serenity and twisted spectacle, the show is an entirely different brand of entertainment. Doors open at 7 p.m. and the show runs from 8 to 10 p.m. Tickets are $30. Click here for more info.